Schizophrenia is equally common in men and women, affecting about 1% of the population. DEFINITION: Schizophrenia is a severe thought disorder. People with schizophrenia can experience false beliefs (delusions) and senses (hallucinations) that may interfere with a person’s ability to think clearly and sense the world the way others do. Schizophrenia is NOT a split in personality. The onset of symptoms usually starts between the ages of 16-30. People with schizophrenia may have difficulty managing emotions, making good decisions, or relating to others. Symptoms can include psychotic episodes (breaks from reality) such as hallucinations or delusions. These can be very frightening to the person experiencing them, because they may have difficulty distinguishing between what is real and what is not. Hallucinations are false perceptions (senses). Hallucinations are when a person might see, hear, taste, smell, or feel things that do not exist. Hallucinations are perceived as very real to the person, but are not actually there. Auditory hallucinations are the most common type. People hear voices that may order them to do certain tasks, warn them of false dangers or be critical of them. People who experience auditory hallucinations may talk or argue with the voices only they are hearing. Visual hallucinations may cause the person to see things that are not there. Paranoid delusions can cause people to falsely believe that others are spying on them or plotting to harm them. Another example of a delusion is when a person believes they have a special mission, or that they have superpowers. People who experience delusions may believe that an outside force is putting thoughts in their head. They might believe that the television or Internet is directing special messages to them. Delusions may also cause someone to believe that they are in communication with a historical figure. speak very little, even when forced to interact. change their eating behavior (refuse to eat or eat unusually). exhibit poor executive functioning (the ability to understand information and use it to make rational decisions). have trouble focusing or paying attention. have problems with working memory (the ability to use information immediately after learning it). have trouble speaking rationally, using garbled speech, or making up words that others don't understand. Medication can reduce the intensity, severity and frequency of psychotic symptoms (hallucinations and delusions). Talk therapy can help people with the everyday challenges of the illness, such as communication, self-care, work and maintaining relationships. With treatment, many people with schizophrenia can lead rewarding and meaningful lives. Be mindful not to challenge a person’s hallucinations or delusions as they are very real to him/her. Understand that people with schizophrenia are rarely violent. In fact they are more likely to become the victims of violence. Understand that schizophrenia is not a personal weakness or flaw in personality or character. Educate yourself about the disorder. Listen to your friend when they want to talk. Keep checking in with your friend. Reassure your friend of your support and understanding. Do not touch the person without their permission. It is also very important NOT to challenge the person’s hallucinations or delusions. These are very real to the person who is experiencing them. Instead, move the conversation to topics that you have in common. ...take your friend’s withdrawal personally. What is the definition of schizophrenia? What is the definition of hallucinations? What is the definition of delusions? Give at least two examples of delusions and at least two examples of hallucinations. What treatments are available for people with a diagnosis of schizophrenia? What can you do to support someone who might be experiencing the symptoms of schizophrenia? How might stigma affect a person with schizophrenia? *Hint: Read the SCHIZOPHRENIA facts at the top of this page to find the answers for 1-6. And view our Understanding Stigma page for question #7. Fact: While there is no known cure for schizophrenia, there are effective treatments. Medications, talk therapies and support from family and friends can help people with schizophrenia lead successful and independent lives. Fact: Early intervention can help! The symptoms of schizophrenia typically begin at a crucial time for brain development (ages 16-30). The symptoms of schizophrenia often derail that development, and early intervention may lead to better outcomes. Fact: Studies indicate that people with schizophrenia who are in treatment are no more dangerous than the rest of the population. Because one of the possible symptoms of schizophrenia is impaired judgment, people with schizophrenia are more likely to be victims of crimes. Fact: Schizophrenia is not a split personality. Rather, it is a thought disorder. The word "schizophrenia" comes from the Greek language (schizo = split and phrene = mind), describing fragmented thinking or split from reality. Fact: About one-fifth of people with schizophrenia have visual hallucinations, whereby they see things that no one else sees. Auditory hallucinations (e.g., hearing voices) are more common, occurring in 70 percent of people with the disorder. A few also experience tactile hallucinations or odd smells. It is important not to challenge the person's hallucinations because they are very real to the person experiencing them. It's OK to ask for help. Talk to a trusted adult. Visit YouthWell.org to find local Santa Barbara County mental health resources. If you or someone you know has harmed themselves or is in immediate risk of harm CALL 911 immediately. 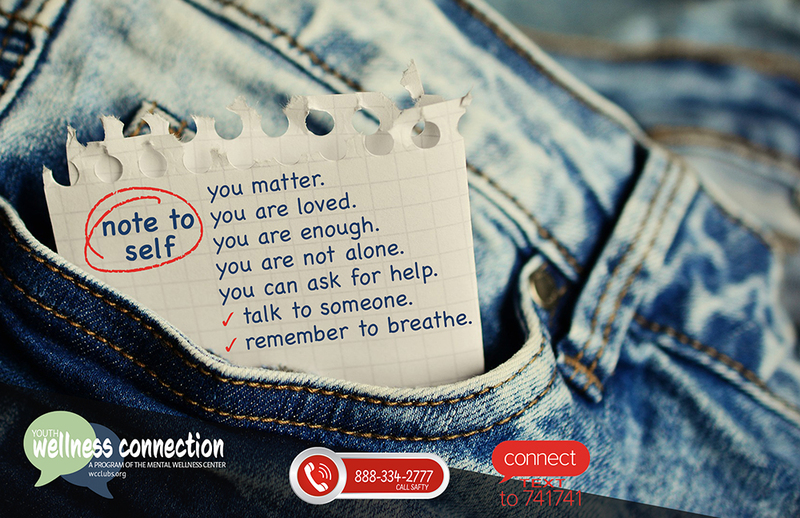 888-334-2777 - SAFTY is a mobile crisis response service available daily 8am-8pm, providing crisis intervention, phone, and in-home support, and linkage to mental health services. Available to all SB County youth, age 0-20, regardless of insurance or ability to pay. Text SIGNS to 741741 for 24/7, anonymous, free crisis counseling. Crisis Text Line serves anyone, in any type of crisis, providing access to free, 24/7 support and information via text. A live, trained Crisis Counselor receives the text and responds quickly. "how to talk to someone who may be suicidal"
YWC Clubs are campus-based and open to all 9th-12th grade students. Club ambassadors are upstanders that raise awareness and reduce stigma around mental health by promoting self-care and kindness through connection, prevention, education & outreach activities! [MON] DPHS & SMHS and [WED] CHS & SBHS. Club meetings are an opportunity to make connections, participate in campus leadership, earn volunteer hours, and make a difference in changing your campus culture. YWC Clubs conduct monthly wellness campaigns and events on campus in collaboration with other clubs and campus resources. 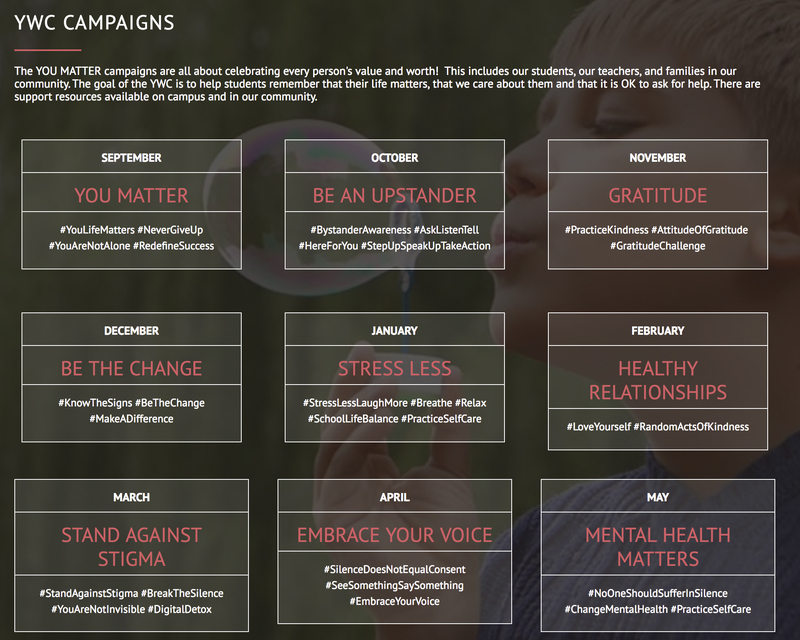 The YOU MATTER campaigns are all about celebrating every person's value and worth! This includes our students, our teachers, and families in our community. The goal of the YWC is to help students remember that their life matters, that we care about them and that it is OK to ask for help. There are support resources available on campus and in our community. Learning about mental health is the first step to wellness. 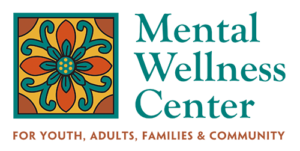 The Mental Wellness Center (MWC) can help families find medical and professional care, as well as teach important skills on how to manage your mental health. Many families in our community have teenagers that are struggling with depression, anxiety, ADHD and other mental health issues. It can be overwhelming as a parent to find support for your teenager and difficult to talk about. The MWC is focused on providing a safe and confidentialspace for families to connect with others, access community resources and get the support your family needs. Come discuss life, work on communication and social skills and enjoy time with your peers! This weekly group brings together teens, 14-18, to learn emotion management in a fun, safe place. Learn and practice self-management skills for better self-regulation. Drop-ins are welcome. MHM teaches basic facts about mental health to sixth and ninth grade students in the classroom. Instructors talk about stigma and how it affects our perceptions of mental illness and taking care of ourselves. Students learn the facts, including symptoms and warning signs, of specific mental health disorders. A peer support group for parents and caregivers of teens, 12-26, struggling with mental health or substance abuse from crisis to aftercare. Parents can connect with others, gain tools, find resources, and learn to manage their children’s needs without sacrificing their own. There are weekly groups to accommodate busy schedules. This 8-hour course is offered monthly at the MWC and teaches participants how to identify, understand and respond to signs of mental illnesses and substance use disorders. It also teaches an action plan to use in a psychiatric emergency. This course can be customized and provided on-site in schools and organizations. MWC offers with the Southern SB County NAMI Chapter presentations with dynamic speakers on topics of local interest related to mental health. View the MWC calendar on our website for upcoming speakers and panels. The MWC Library Online Catalog is freely available on the internet. Simply input “MWC Library” as the library name; no password is required. You may check out the library collection during MWC open hours or formal meeting periods. Contact the MWC Receptionist or your Support Group Facilitator to register as a Library patron and obtain information on Library procedures. For further information, please contact MWC Librarian: joan.ariel@gmail.com. One of the very best ways to deal with issues, experiences, and uncertainties surrounding mental health disorders is to become informed and increase your knowledge. The Library at the Mental Wellness Center provides books for independent learning available for loan to MWC clients and client families. The collection covers a wide variety of topics related to mental health and wellness. It contains books on a range of mental health disorders including ADD/ADHD, anxiety disorders, bipolar mood disorder, depression, eating disorders, and schizophrenia. Materials on client and family coping and survival strategies, drug abuse in dual diagnosis, and suicide are also available. You will also find a limited selection of materials on psychopharmacology, memoirs, some relevant fiction, and a small collection of books written for children and teens.